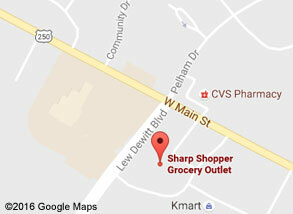 Our sixth store opened in August of 2007, and is located at 2800 A West Main Street, Waynesboro, VA. Holidays: We are open Memorial Day, Fourth of July, and Labor Day from 8 a.m. to 4 p.m. We are open Christmas Eve and New Year's Eve from 8 a.m. to 5 p.m.
We are closed New Year's Day, Thanksgiving, and Christmas. 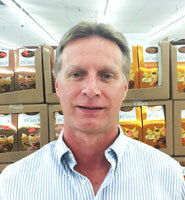 Sharp Shopper features close-outs from the grocery industry. Closeouts become available because of overproduction, packaging changes, seasonal items, warehouse damage, or short date codes (click here for our Product Dating page). Inventories constantly change because of the changing availability of products. 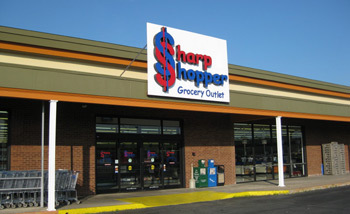 In addition to closeouts, Sharp Shopper offers fresh bread, dairy products, produce, bulk foods, soft drinks, etc. for your shopping convenience. See our "About Us" page for more information. Sharp Shopper operates under all the same state and federal Department of Agriculture regulations as any typical grocery store. Gift Cards can be purchased at any Sharp Shopper store by calling or stopping by in person.